Over the course my event planning, my Daughters first birthday morphed into a pinwheel theme. Maybe because they are easy to make or just so darn cute, its hard to say, but the idea of making edible pinwheels just wouldn’t get out of my head. 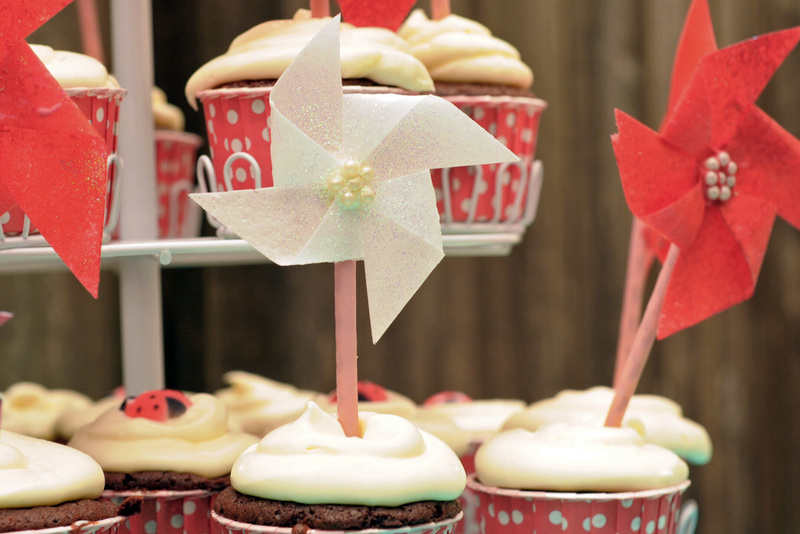 Edible pinwheel cupcake toppers!! Could it be possible? Oh, I made it possible. It was quite a crafting adventure from start to finish and if you plan to attempt these, I hope that you can learn from my mistakes. To get the pinwheel in the right shape, you need a square piece of paper. I tried 4×4, 3×3 and 2.5×2.5. My favorites were the 2.5 squares, big enough to be put on an edible stick or to be used on its own. Because I wanted the pinwheels to match the red and aqua color scheme that I had going, I tried to paint the rice paper. Really, I wouldn’t advise this but if you want to attempt, it didn’t go horribly awry. I used a clean standard paint brush and put a small amount of gel food coloring in a small bowl. I put a small amount of vodka in another bowl. With all the squares on a sheet of wax paper, I dipped my brush just a tiny bit in the vodka and then mixed it into the gel just enough to make it spreadable. I then painted each side of the rice paper squares. It worked OK. I also made some royal icing and tried that as well. I was marginally more successful with that. I then placed sugar pearls in the center to cover up the ugliness left behind by the icing “glue”. Still, I wasn’t happy. The food coloring left inconsistent color variations and although technically edible, the excessive amounts of gel coloring left a flavor that I describe as “kinda yucky.” Next, I went back to the plain white squares of rice paper. I cut them the same way I did the red dyed ones but decided to “glue” the flaps to the center with melted white Wilton’s Candy Melts. MUCH BETTER! I added the sugar pearls again to cover the mess. Although this process was much easier and faster than the painting fiasco, they looked too plain. I had some Disco Dust on hand, as well as a mini spray bottle. I found the mini spray bottle at the trial size section of Target, but you can also over pay for them at cake supply stores. I filled the bottle with vodka. A little side note about the vodka: my double mention of liquor as well as its residence in travel size containers isn’t because motherhood has driven me to alcoholic tendencies, it’s a common practice among cake bakers. Vodka will evaporate completely (not a trace of alcohol left behind so it’s safe for the little one) so it won’t water down color or dissolve sugars the same way water will. OK, back to the pinwheels! I just sprayed one spray of vodka on the pinwheels and then sprinkled them with the aqua colored disco dust. I tried two sprays and that made the pinwheel curl up and there wasn’t anymore dust that adhered then with one spray. I loved them! I then decided to go on a mission to find some sort of edible stick to put them on. After wandering around the grocery store, I happened upon Pocky in the Japanese section of the market. YAY!! SO perfect, other than the fact that this is the one thing that deviated from my aqua and red color scheme, I was happy. Perfect size and actually yummy. I glued these on the back with the candy melts as well and they looked perfect. If you want colored rice paper, buy it that way. Those were the best! I discovered that the whole thing was edible by accident. I went to lick the frosting off of the bottom of the stick and a piece broke off in my mouth to my delight! The little things that make me smile! Thanks for that yummy treat Jackie!